A little bit of plot, the timeline for The Bureau: Xcom Declassified is set in late 1962, as it was the climax of the Cold War between the USA and the Soviet Union, and thus the creation of The Bureau, which was originally created for the purpose of coordinating US Military forces if ever the Soviet Union decided to attack the USA. Alas, it was not Soviet Union that attacked USA (or the world), but extraterrestrials, which was dubbed as Outsiders. This occurrence forced The Bureau to launch prematurely and counter-attack the said threat. Give me some emotions, Carter! The plot itself sounded great on paper, a retro timeline, and aliens invading Earth with their super advanced weapons while the Earth dwellers struggled as they were outclassed. Sadly, it never took off in The Bureau: Xcom Declassified, and instead, we got a one-sided protagonist and sideline characters. A plot twist that tried too hard, and just became too forced and generic. The potential for a good storyline is immense here, but sadly, the developers had missed every chance and opportunity to create something unique and immersive. The characters are simply disappointing. They never felt genuine, and they feel so dejected and forced most of the time. 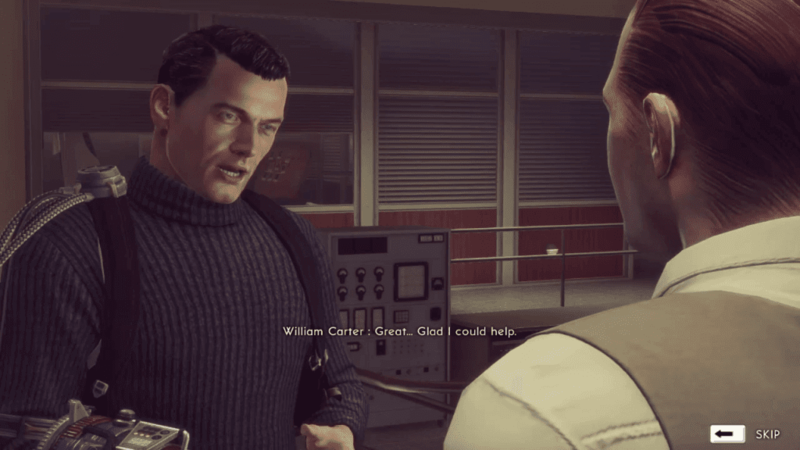 Trust me, William Carter’s reactions are way off, and he is so bland and uninteresting. The story never felt canon to the franchise or even Enemy Unknown, it just has a lot of holes and would just break the whole plot of Enemy Unknown. This is simply a spin-off, that never did it right. Though, it is not like previous Xcom games have an immersive storyline, either. Then again, this is a different genre, and usually, for a single player third person shooter, the story should be at least coherent. PS: I never got how they covered up the alien attacks, everything was attacked and some towns were utterly destroyed. Maybe, they also had that “device” Men in Black used in the movies to remove memories. Just keep shooting them team! The only aspect of The Bureau: Xcom Declassified that is worth mentioning is its graphics. Everything is actually rendered very nicely, especially the fine detail of the environment and backdrop of each mission. It makes you want to explore more, and see the world as the outsiders destroy it. Sadly, You cannot do so as it is a linear game. The enemy and NPC models look good enough for the time the game was released. However, it is quite generic on the side of humans, they could have added more variety and less generic looking faces in the headquarters. Meanwhile, the main characters of the game stand out among the rest, which is good as they became more memorable to say the least. The cut scenes, on the other hand, are step backs since most cut scenes lack consistency on what you equip. It is predetermined for you and your squad to use a military rifle, even if you already found plasma guns early in the game. It is quite dumb to see it on a 2013 game. These squad controls are quite clunky, but really helpful. The gameplay for The Bureau: Xcom Declassified is the same as any other third person shooter you could come across. It has some tie-in gameplay from Xcom Enemy Unknown, you can command your squad, which consists of two unparalleled babies– I mean, soldiers. You can command them to use their skills, where they have to go, and who they have to attack or flank. They would never actually do these things unless you micro manage each of them, which deliberately made the whole game tedious as you have to babysit them every encounter with the enemies. Before missions, you are entitled to customize your squad. Pick a specific class, editing their weapon, using boost packs, etc. You can also acquire skills every time you or one of your soldiers level up, which has some extent of variety for each class, which is good. The customization is quite limited, to be honest, but at least it is there to add flavor to the game. Each mission of The Bureau: Xcom Declassified is done well, despite being linear. It is very enjoyable to just kill waves and waves of outsiders, and other extraterrestrial enemies. However, it would have been much much better if it has more branches than to tackle head-on the enemies. Side missions are few here and there, but again, they are done well, and interesting enough to finish them, though I hate how useless the rewards are, and how dejected they are to the main plot. Headquarters are useless and a waste of time to roam around, unlike Xcom: Enemy Unknown where you can build parts of the headquarters, buy stuff, research, and other great stuff. Headquarters in The Bureau: Xcom Declassified is more on run-and-talk-to-NPC kind of trend, which is utterly stupid and tiring to do. The Bureau: Xcom Declassified also tries its hardest to copy Mass Effect as it has its own dialog choice system, in which case not necessary whatsoever here in the game. Instead, it made the game longer than it should have been. It has no bearing, and just a waste of time, honestly speaking. The worst part of its gameplay is the AI, both parties are similarly dumb. Although, enemies have a lot more varied ways to attack you since there are different types of enemies. Your squad, on the other hand, just failed to do anything worthy, and again you must babysit them to victory, otherwise, you are just going to get overwhelmed by the waves of enemies trying to attack you. In short, the gameplay is a decently generic third person shooter, but as we know, other games had done it and much better. The soundtrack is decent, it is likeable, and it fits with the theme and setting of the game. The sound effects are also well done, such as the sounds of the gun shots, and even the muffled noises of the outsiders. Voice acting is okay, but could have been much better. Like I said, the characters never felt genuine enough for anyone to invest in these characters, but it is no doubt that the quality of voice acting is there, it is just not that immersive. Do not bother with this one, this game is to be finished and to never look back again. There is nothing to go back to, unless you want to go through with the game with no incentive whatsoever. Although, there are technically 7 (but actually 4 to 5 endings) different endings, but those endings only matter at the end, so you can easily restart the final mission and choose a different ending. The ending scene is different in some way, but it still does not connect to Xcom Enemy Unknown. The Bureau: Xcom Declassified is simply a mediocre third person shooter, which could have been above average but fell apart on many occasions. One of the reasons could be the fact that they kept changing directions during the development and ended up not reaching a compelling flow for the game. It has a weak and inconsistent story, generic gameplay including one of the dumbest squad AI you could ever have as a player, and dull characters. Graphics is its only saving grace, to be honest, but even that suffers from some things like the cut scene and other NPC models. It is enjoyable to some extent and you can definitely get this game @ 75% off its price during steam sales. I just do not think it deserves the Xcom brand to its name and I believe it would have been better story-wise if this is just a different game altogether.